On June 10, 2015, with the blessing of His Holiness Patriarch Kirill of Moscow and All Russia, a delegation of the Russian Orthodox Church arrived in Istanbul for the name day of His Holiness Bartholomew, Patriarch of Constantinople. The delegation was led by Bishop Ioann of Naro-Fominsk, administrator of the Patriarchal Parishes in the USA. He was accompanied by the Rev. Mikhail Asmus, adviser, Moscow Patriarchate department for external church relations, and Deacon Fedor Shulga, DECR. Patriarch Bartholomew’s name day celebrations began with Vespers at the Monastery of the Life-Giving Spring of the Most Holy Theotokos in Valikli. At the Patriarch’s entry to the church, Russian children living in Constantinople presented His Holiness with their drawings. After the service the congregation was entertained at the monastery yard and all those who wished to extend congratulations to His Holiness could do it. 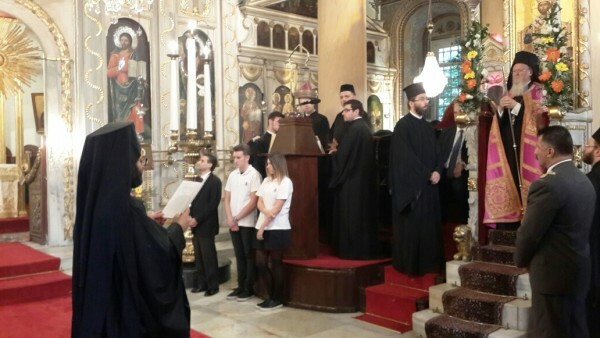 On June 11, when the Church of Constantinople celebrates the memory of the Holy Apostles Bartholomew and Barnabas, the ROC delegation attended the Divine Liturgy at the St. George Church in Fanar. Other Local Churches were represented by hierarchs from the Patriarchates of Alexandria, Jerusalem, Serbia and the Church of Greece. Among those who came for the celebrations were also bishops and laity from Western Europe, pilgrims from Greece and Serbia, as well as clergy of the St. Panteleimon and St. Andrew representations of Constantinople together with their Russian parishioners. After the liturgy, the Synod’s oldest member, Metropolitan Konstantinos of Nicaea, greeted His Holiness on behalf of all the hierarchy of the Church of Constantinople. Then Bishop Ioann of Naro-Fominsk read out a message of greetings from Patriarch Kirill of Moscow and All Russia and presented his gift to his Brother of Constantinople, an icon of St. Cyril Equal-to-the-Apostles. In his response, Patriarch Bartholomew thanked the heads of Local Orthodox Churches for having sent their representative to his name-day celebrations and all those present for their participation in the festivities. After that a reception for high guests was given at the Bosporus coast, during which Bishop Ioann had an opportunity once again to convey brotherly feelings from Patriarch of Moscow and All Russia to the Primate of the Russian Church’s spiritual Mother – the Church of Constantinople.